“Once I got finished wrapping the movie, it took me some time to talk through how I was feeling,” Jordan said. Jordan said that he saw a therapist after filming the movie and that it took him about a month to get through it. 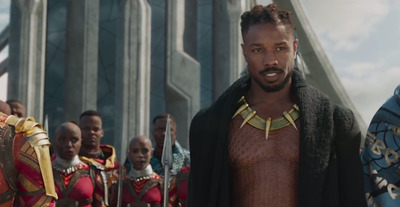 Michael B. Jordan’s performance as the villain Erik Killmonger in this year’s Marvel blockbuster “Black Panther” has received widespread acclaim. The character was so compelling that it even inspired a viral hashtag, #KillmongerWasRight, after the movie’s release. But on an episode of “The Bill Simmons Podcast” last week, Jordan opened up about the mental state that playing Killmonger left him in. “That character you played, you went to a dark place for it, and you were having trouble coming out of it,” Simmons said. Jordan explained why that wasn’t the case. Jordan said that he talked to a therapist a few times and that it took him about a month to get past what he was feeling by “getting back to just doing regular things,” like being present with his friends and family.